This page contains archived updates for the new build, with the most recent updates added to the top of the page. Not much to share in the last two weeks, as the steel frame is finished, and most of the work is at the footings of the steel columns. They've all had a coat of bitumen as a waterproof sock, and the foundation/retaining walls are now being laid. There are pallets and pallets of blocks waiting to be laid. Meanwhile, back in the office, Gary continues to work on the schedule and procurement. There's quite a juggling act to manage the interface between all the different elements (e.g. the pipes going through floor slabs, the brick and block meeting the roof), as well as between all the contractors. Meetings have taken place with potential scaffolders and bricklayers (for the main walls), and with the roofing contractor to finalise order details. 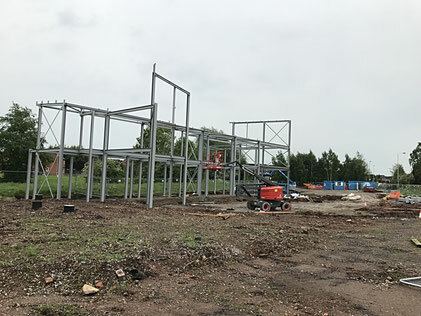 This Sunday (25th) we will be meeting next to the site after our morning services to have a short service of thanksgiving for the steel erection - as we celebrate seeing the building rise above ground level. All are welcome to join us in the Whittle Estate car park from 12:30pm. The main steelwork frame is now complete on our new church and community building. It's been lined and levelled, and next week, once the grouting at the bases is complete, some of the bracers will be taken out ready for the precast concrete floors to be lowered in, in due course. 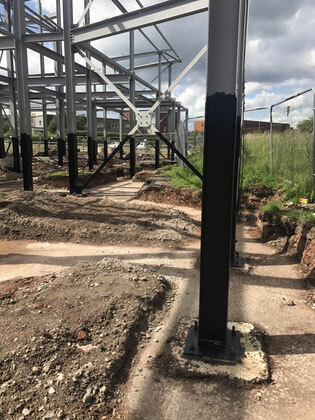 The steel columns are now getting rubber boots - the groundwork team are painting bitumen compound onto the steel that will be below ground level once the building is finished. 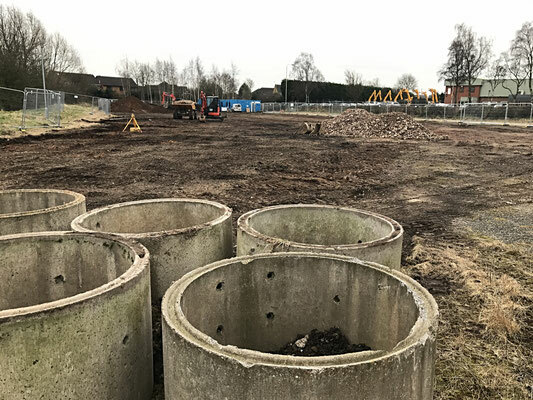 The groundworks contractor is back on site, and Phase II has started - this involves building up the below-ground level brickwork and retaining walls, protecting the base of the steel columns and preparing the site for installation of the first and ground floors. There's two videos to share this week. The first is a guide around the new building, filmed at the end of week three when the frame wasn't quite complete. The second is a time-lapse video of the whole four weeks of construction. 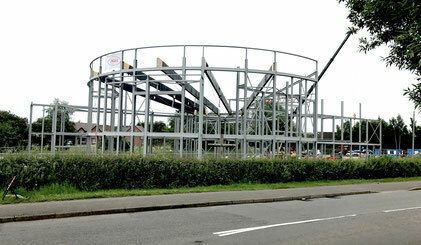 A short working week due to the Bank Holiday - but the steel frame work went up apace as soon as MQM were back on site. The final Glulam beam was lowered into place, the entrance and rest of the atrium was fitted out, along with the vestries and surround for the spiral staircase in the corners of the worship space. By Friday, the first of the girders holding the roof over the upstairs hall was in place, and the front section of the right hand side of the church is almost done. By the end of next week, all the steels will be up, set square and lined up, and the rest of the grouting of the bases will be underway. There continues to be a lot of interest about the build - I'm told from as far away as Japan! This is the main entrance to the building... not much to look at at the moment, but glazing top to bottom will give views of the atrium, stairs and youth pod beyond. The view from the corner of Dog & Gun Lane and Cambridge Road - it's already an imposing edifice! Much behind the scenes work found a huge, extendible, rear-steer trailer truck arrive at site on Tuesday morning. It carried the five massive Glulam beams and the brackets needed to attach tie-bars (stops them sagging) and to the steel frames (stops them falling off...). 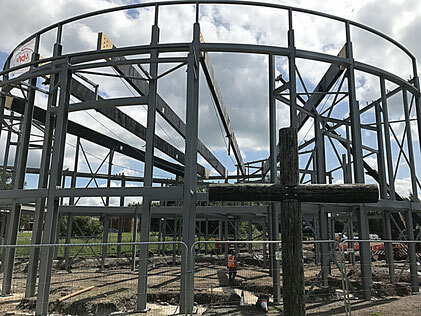 By the end of the week, the brackets and bars had been shot-blasted, primed and painted, and four beams had been installed by the close of business on Friday afternoon. Gary checks the beams which are wrapped in black plastic for weather protection. After some more site prep to allow the truck to get into place, the beams were unloaded. Behind the scenes: a meeting with the precast concrete suppliers to discuss the specific practicalities of fitting the floor to the balcony; hot and cold running water is provided in the canteen; an order has been placed for road sweeping services; 60 litres of drinking water has been consumed by the contractors over four days (due to the heat); signing off final revisions of the siphonic drainage; planning roof access for ongoing maintenance. Firstly, my apologies for the gap in updates. 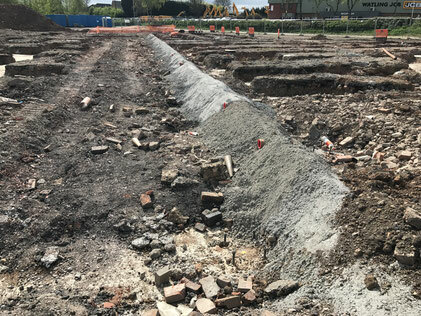 You've missed little on site - the foundations were prepared for the crane 'runways' either side of the central drain run (see Week 10 pic) and the spoil mini-mountain has been removed. Behind the scenes we have been finishing the site setup in readiness for us taking over as Primary Contractor. We've split the interior of one of the containers into two - a site office, and a drying room for contractors kit - which required some partition walls and doors to be installed. All the right forms, signage and kits (first aid, eye wash, burns, emergency spills kit) have been printed off and laminated, or purchased, and installed. Site communications and IT have been installed and are working well. This flurry of activity had to happen around site meetings, to-and-fro emails, planning, procurement, editing of site documentation and making sure the bills are paid quickly (we get a discount if we do!). All of this brought us to Monday 15th May, when we officially took over the site from the groundwork contractor and became Primary Contractor. 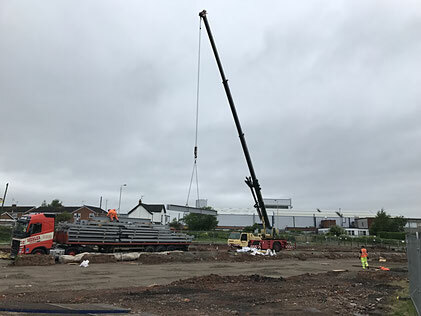 By 7am that morning, Alan was inducting the steel erectors and crane driver onto site and shortly after, lorries of steel parts were ready to be unloaded. By 10am the crane was ready for its first lift, and by the end of the day, the steel frame had been started. Who knew? Churches come flat packed! The first lift of the day. 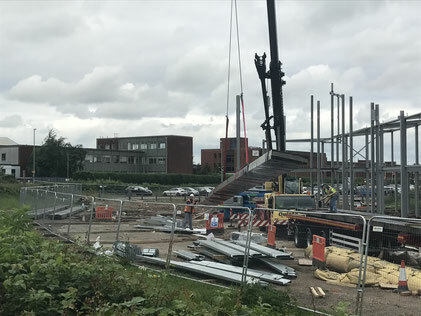 Despite the two inches of rain we've had this week, the steelwork has been steadily going up. The steel frame has been split into 'lots' for reference, and order of erection. There are six altogether; lot 1 is complete, and lot 2 close behind. Already identifiable are the first floor offices, ground floor meeting rooms, their respective corridors, and the left hand side of the main atrium/street and the left corner of the worship area. End of week 1 of steel framing. Holding the whole thing together... nuts and bolts. Timelapse video: five days in two minutes! 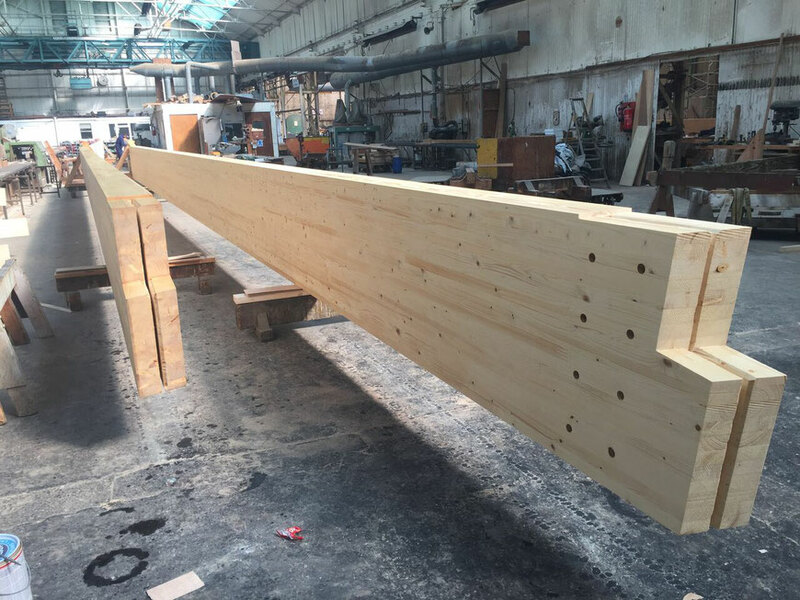 Remember the Glulam beams I mentioned in Week 6 update? The manufacturers have been kind enough to send through some photos of the beams as they are being built at their factory. These are two of the five enormous glue laminated wood beams that form the span across the double height worship area. For a sense of scale, look at the paint tin in the bottom left of the photo - and at the far end of the beam, you can see someone working in a blue boiler suit. 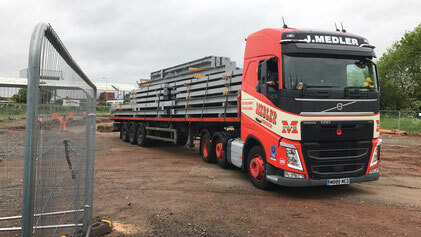 Backing the lorry onto the site with these on the back is going to be quite a feat... and if you're behind them on the motorway, our apologies, but smile and wave at the driver! Unfortunately, due to various logistical issues, our programme has had to slip a few weeks. After an on-site meeting between ourselves, the ground works contractors, the steel fabricators and erectors, and the precast concrete suppliers and fixers, a revised plan has been agreed. This discussion had to cover - where the cranes can and can't go, and what they need in place to go where they need to; how far the cranes will reach; what will be in the way and why it can't be; what isn't there but needs to be; which bits need attaching before and after something else gets fixed in place. We're very thankful for Gary's expertise in the fine-tuning in planning that a job of this complexity requires. With the break in work on site, I managed to get a couple more photos of key elements of the foundations. This long mound of concrete runs down the centre of the building covering pipework which will eventually provide drainage for, ahem, all the toilets and sinks. Yup, this is the business end of the sewerage pipe, the other end of which was punched through the hedge in Week 5. Right back in Week 1, we had blue crosses appear on the grass - but it wasn't clear at that point what they marked. This blue cross, however, marks the centre point of the outside curve of the main worship area. The two fixings either side half way up the photo are the wall edges to the inset section, and just in front of them will be the platform and where the baptistery will be. This is pretty much the view that you'll get from the lecturn - hard to imagine 500 people in front of you? I promise to take a photo of just that moment! There's a short hiatus in activity on site before the steel frame arrives. We're taking the time to finish renovating the site cabins, particularly fitting out the site office for use (it's been a drying room up to now). 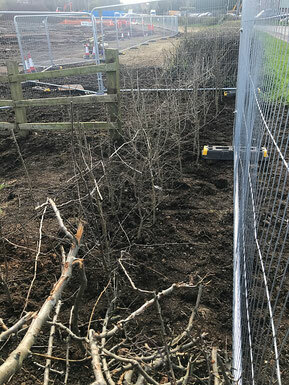 As mentioned last week, there was a sizeable section of hedgerow at the corner of the site that had to be removed to allow the installation of a new sewer to serve the building. Two volunteers from the church heeled in forty bare root hawthorn (and yes, they were very thorny) saplings on Tuesday morning, and with a sprinkle of fertiliser and the rain on Wednesday they should be off to a good start. Behind the scenes, we're working with the steel erectors and floor slab suppliers to work out where the cranes need to go to reach the extremities of the building. This has been quite a complex task, and there will be at least four positions that the crane will need a level platform preparing. As a result, it is likely that the steel erection will be starting in the second week of April, though it may be a week earlier. I've not had chance to get to site this week to take a photo of progress - apologies. 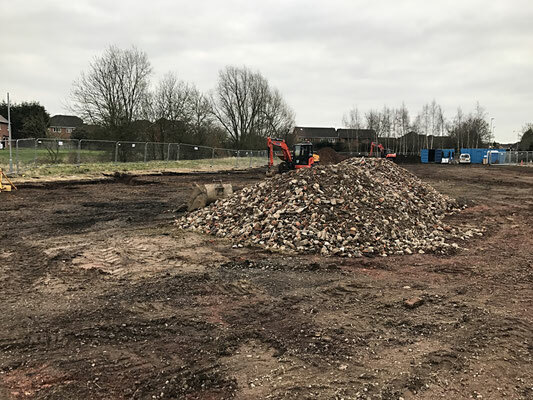 However, I can tell you that the initial groundworks have been completed, and the site is ready for the steel to arrive and be erected at the beginning of April. 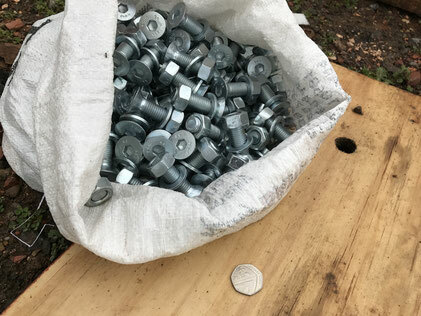 Replacement hawthorn hedging has been delivered to patch the hole made by the installation of the new sewer, and 40 bare root plants will be planted on Tuesday morning. In the meantime, above is a design drawing of all the steelwork that will make up the main framework of our new building. 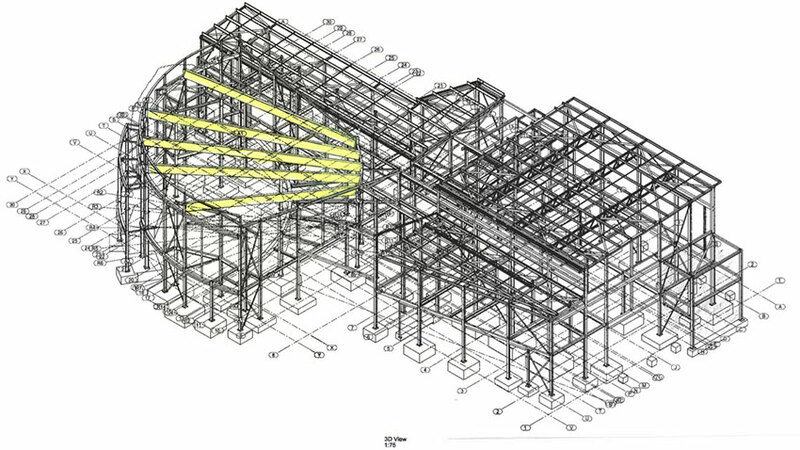 The massive 18 metre long Glulam (glue/laminated wood) beams making up the support for the roof over the worship area are marked in yellow. This huge meccano set includes almost 140 tonnes of steel - that's the equivalent weight of 19 elephants, or 85 average size cars. If it were to be worth its weight in gold, we'd have had to find a cool £5.5 billion. If melted down into one great big lump, it would be 3m x 3m and 2m high - the equivalent volume of 110 baths filled to the brim - or 31,000 large mugs of coffee (or builder's tea). Aside from our mini-mountain getting a little bigger with the spoil from drainage and utility trenches, there's not much more to see above ground that's changed. Except for the hole in the hedge where a trench had to be dug. Over the next couple of weeks, the groundworks team will be readying the site for the steel erectors. 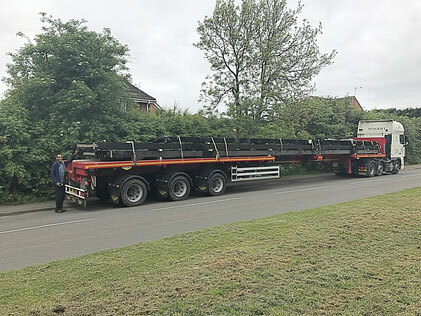 They'll be making a couple of level pads from which a crane will be working, and moving the spoil heap so that the large beams can be off-loaded. 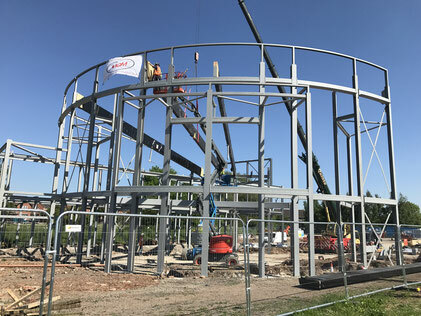 The steel work is currently being manufactured, and hopefully will be on-site and being put up from week beginning 3rd April. 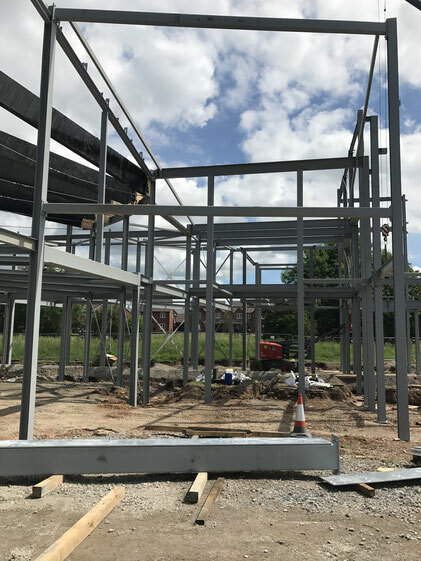 Once the main frame is up, the first floor concrete slabs will be craned in, along with two staircases, after which the remaining steels will be fitted. Next week, we'll be sharing information on the steelwork, including the design and how much steel is actually going into the build. 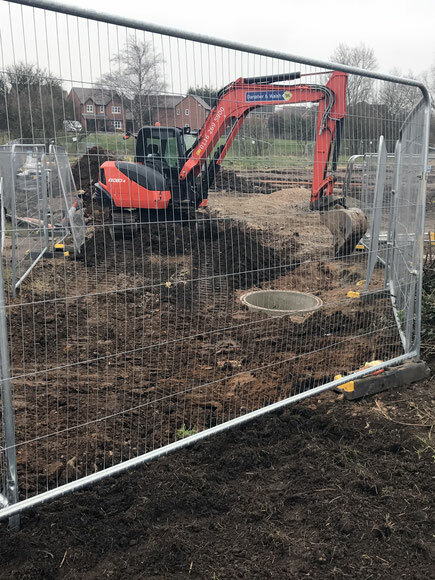 There's not much new to see on site this week, as the ground work team have been concentrating on finding all the utilities (some aren't where they ought to be apparently) and getting the preparatory work done for us to be connected to electrics, water and sewerage. In the photo, the red and white cones mark the outside curved wall of the worship area, and the yellow tripod is just about in the middle of the entrance foyer. We're also hard at work behind the scenes, with site meetings, prospective contractor meetings and chasing up the various utility companies for the connections we need. Please continue to pray for our project management team (who meet on Monday evening), our contractors and the community we will be serving from our new building. 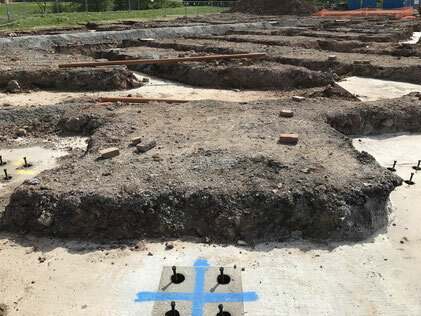 Now there's concrete in the trenches, connection points for the steels are evident, and the building footprint is much clearer. The mini-mountain has grown! 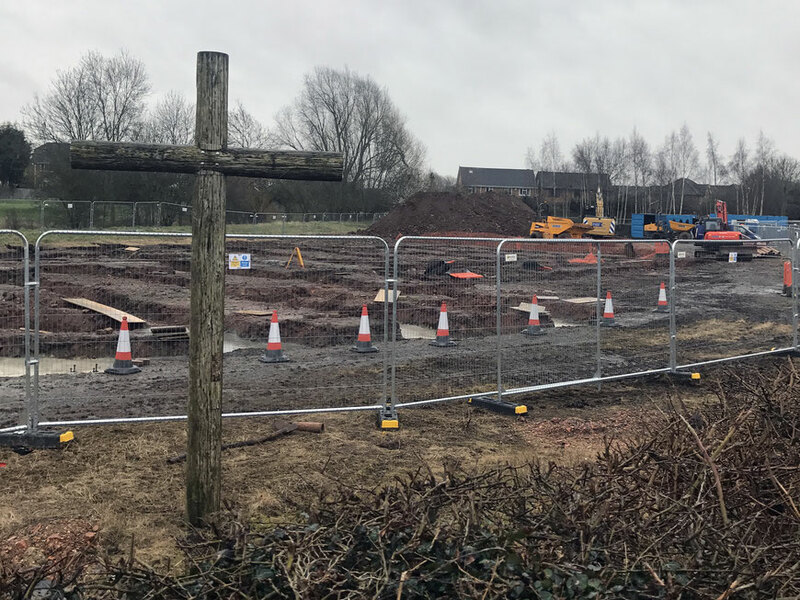 There's another couple of weeks before the initial phase of ground works is complete, after which the steels will arrive and be erected and we can start to appreciate the size of the new church. 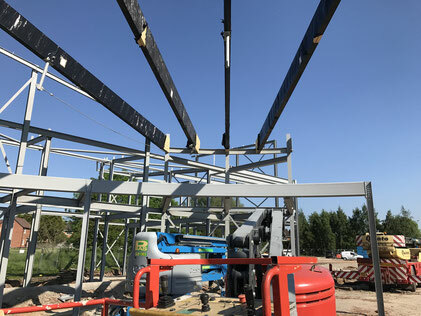 Behind the scenes, the massive Glulam beams which will be supporting the roof over the worship area have been ordered and their connections to the steelwork have been designed. The second week on site sees the appearance of more trenches, and a small mountain developing in the corner of the site - after all, the earth has to go somewhere... Reinforcing steel has arrived, and you can see where it has been dropped into some of the foundation trenches, where it will eventually strengthen the concrete. With the heavy rain in the middle of the week, I imagine that conditions at the bottom of those trenches is somewhat boggy at the moment. Please continue to pray for favourable weather conditions. 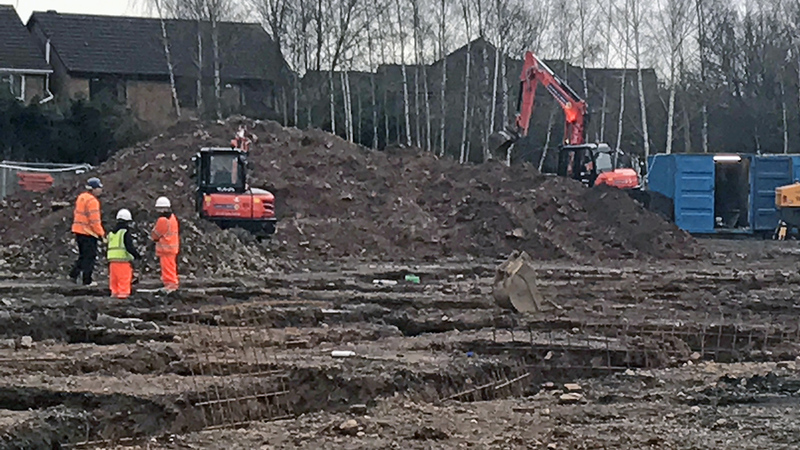 Danaher & Walsh, our ground works contractors, started on site this week. 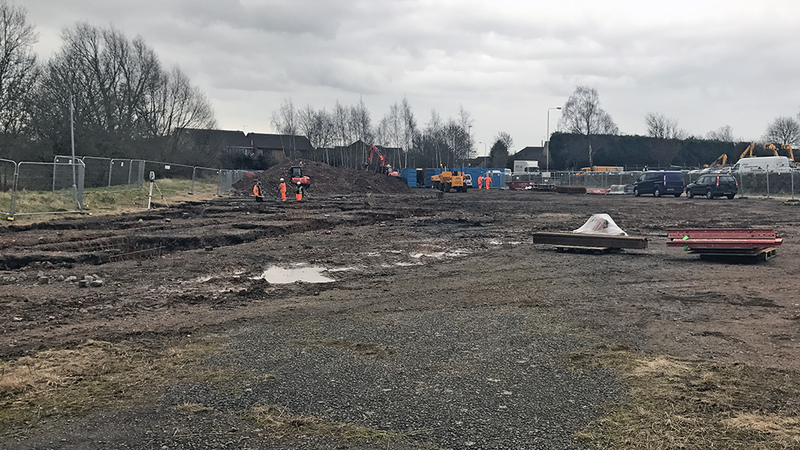 They have scraped back the weeds, marked out the building, and have started to dig the trenches for foundations and pipework. We have arranged for a temporary interim water supply and a standpipe for this was delivered on Thursday. A temporary electricity supply is being arranged, and should be in place within the next few weeks. 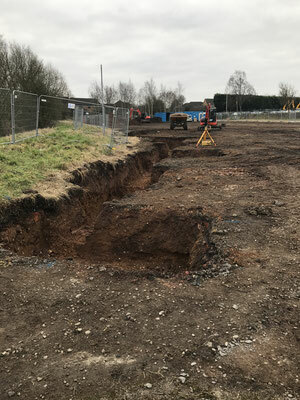 Things to be thankful for: access permission from Whittle Estate to use the car park gate while our entrance drive is strengthened, and that the weather conditions have been favourable for the start of the ‘mucky’ digging stage. Things to pray for: continuing favourable weather conditions; early slots for the supply of temporary electricity and water supplies; that there are no ‘surprises’ under the surface as the foundation trenches continue to be dug out. On Sunday 6 November 2016 Whetstone Baptist Church will mark the start of construction of their new £4m church building with a ground breaking ceremony attended by the whole congregation, guests and villagers. This Sunday, on their church anniversary, the members of Whetstone Baptist Church will see their mission to build a state-of-the-art church for the local community begin to become a reality. The ground breaking ceremony at 12.30pm, will be attended by the President of the Baptist Union, Rev Rupert Lazar. Whetstone Baptist Church run a range of outreach events and services for the local community including Alpha courses, Messy Church, budgeting advice, youth, toddler and children’s groups, a playgroup, senior citizens’ groups and ministry in care homes. The construction of the new church will take about two years. The church is being built on the corner of Dog and Gun Lane and Cambridge Road in Whetstone. It is a self-funded project with around £3m having been raised or pledged so far by the church congregation. The members are not only involved in paying for the building but also in off-setting some of the labour costs by doing some manual labour themselves. For many people this is the biggest personal investment in a building they will ever make, so the ceremony will be a special time of reflection and celebration. Physically fit volunteers are required to help put up wire fencing around the site, and someone prepared to provide refreshments would be marvellous. If you can help, please sign up in the church foyer, or let Neil know asap. A prayer card is available in the church foyer with prayer pointers for the new build, with a list of the project team and board members for WBC Design Co Ltd. Following the special church meeting at the end of July, we have appointed a site manager who is working with Gary Anderson in planning what happens next, as well as an order of works for the whole project. The site manager is also seeking suitable contractors and quotations for the various phases of work. Before we even start on site, there is still a lot happening: the initial work already under way includes procuring and erecting site fencing; arranging hedge cutting, preparation of the site and installation of water, sewerage, electric supply and telecommunications; and setting up the site office, canteen and WCs for the contractors. Policies and procedures are being formalised for double-checking quotes against the tender requirements, appointment of contractors and management of site inductions and other statutory obligations. Along with the site manager, an administrative assistant (church member TBA) is helping to source health and safety signage, bring together all the required site documentation and will coordinate volunteer rotas once roles are identified that church folk could fulfil. Quotations are being sought for a large sign providing information about the building, which will be accessible by passers-by. A finance assistant (church member TBA) will be making sure all the right bills are paid at the right time, with double-checking procedures in place to make sure we're getting what we paid for and not paying for things we haven't had. The Project Management Team continues to steer and approve the whole process on behalf of the church. Microwave for contractor canteen - following an appeal, two have been offered - thank you! Fridge for contractor canteen - following the appeal, we have one offered - thank you! 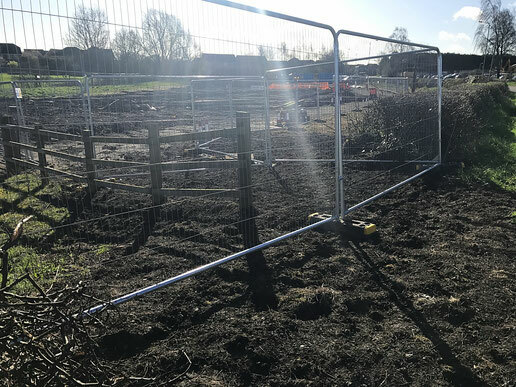 We will be requesting volunteers to erect the site fencing once we have a commencement date - we will need a couple of teams of four that are able to manoeuvre wire fence panels and their concrete feet. The loan of a couple of heavy duty pneumatic tyre wheelbarrows would also help. We'll also need a couple of people to prop up/steady the panels as they are fixed (no heavy lifting) and others to provide refreshments. The date for this will be announced as soon as it is available, and will be the very first job of moving onto the site - get involved from the beginning! - patience! The summer holiday season has meant that progress isn't as fast as some would like, but it is happening!